On January 23rd,1902, Seth G. Stephenson, of Kirk Ella, Hull Fifth Circuit, at the age of 58, passed home to God. He was born June 7th, 1843. His mother died the February following. Seven years later his father was smitten down by the cholera then raging at Market Weighton and the neighbourhood where he resided. His parents were Wesleyans, On the death of his father he was taken in charge by Methodist friends at Londsborough, from whom he received great kindness. As soon as he was able he entered into farm service, and while living at North Dalton in Driffield Circuit in 1843, gave his heart to the Lord. 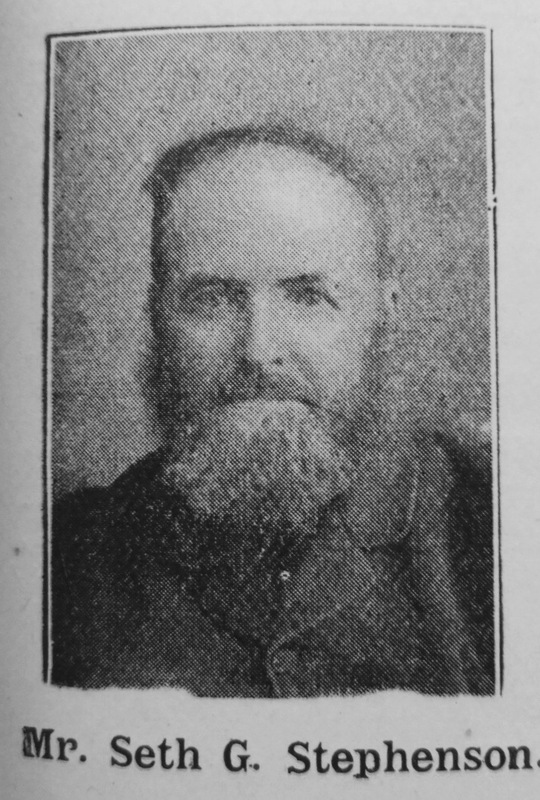 A few weeks before he had married the daughter of Mr. D. Lyon, a popular local preacher of the village, whose influence and example helped him to decision for Christ. Mr. Stephenson at once became an earnest worker in the cause, a few years later became a class leader and local preacher, which offices he sustained for many years with credit to himself and the Connexion to which he belonged. His preaching was experimental and practical, and he was received with more than ordinary acceptance to the pulpits of our churches. He was a man who prayed and preached with fervour, and in the demonstration of the spirit. For many years he was what is called in Yorkshire a farm bailiff. He lived on the premises connected with the farm, and had in his house the servants who worked the land and looked after the cattle. These circumstances gave him opportunity for usefulness, of which he did not fail to take advantage. The religious atmosphere of his home was such that year after year many of the young men domiciled with him were brought to Christ, and some of them have since risen to improved conditions of life in the world. He was a man valiant for the truth. In appearance – face and form and bearing – he was more like a wold farmer than an agricultural labourer. He was an ardent Primitive Methodist, and has filled nearly all the offices open to a layman in his church. His last affliction was painful and protracted. For nearly twelve months he battled with the dire malady that eventually crushed out his life. He was marvellously patient. We always found him calmly trusting in the Lord Jesus Christ, without a doubt or fear. Death had no terror to him. Life ebbed out gently. He was very weak. A few hours before the fatal moment came, and when he seemed unconscious, he opened his eyes and looked on his family standing around, whom he evidently recognised, and feebly and faintly whispered “Going home.” They were his last words, and remain an invaluable memory to those left behind. Seth was born in 1843 at Market Weighton, Yorkshire. His father William was a labourer. On the death of his father he was taken in by John and Mary Atkinson. Census returns identify the following occupations for Seth. Seth married Harriet Lyon (1839-1903) on 23 December 1863 at North Dalton, Yorkshire. Census returns identify one child.